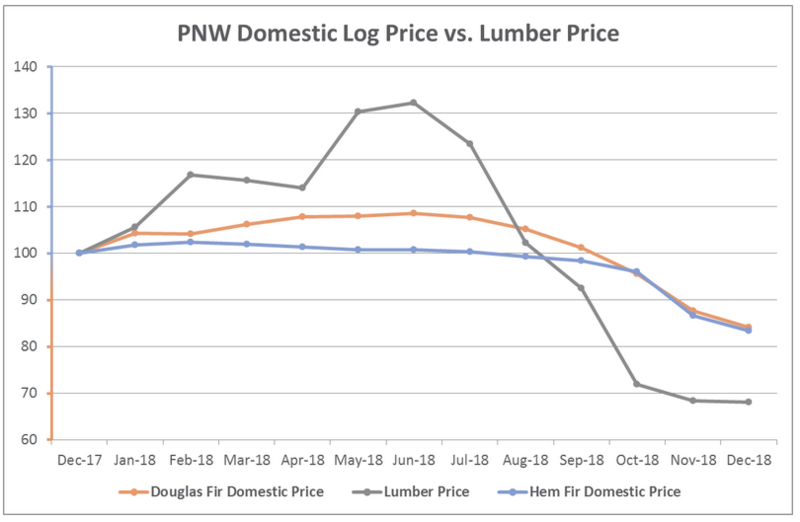 Beginning in 4Q2017, prices for domestic and export Douglas fir logs in the Pacific Northwest (PNW) rose steadily before they spiked in 2Q2018 to record levels. The phenomenon occurred when North American lumber prices also surged to record highs. 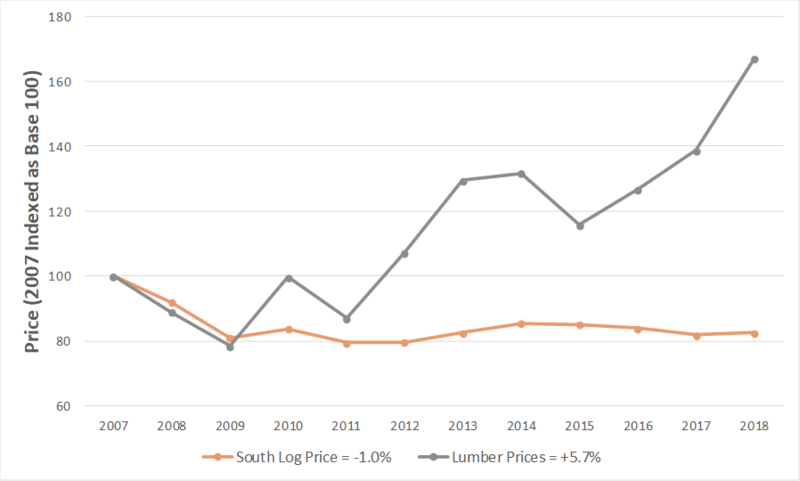 While regional lumber producers in the PNW couldn’t fully capitalize on high lumber prices due to their equally high log costs at the time, producers in the US South were perfectly positioned to take advantage of the market and maximize profits. 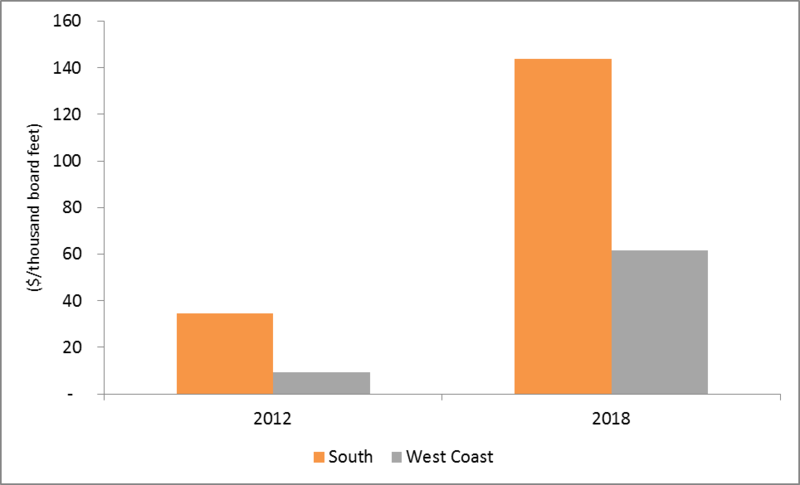 There are several supply chain differences between the forest industries in the PNW and US South, but what are the primary differences affecting sawmill profitability in the two regions? 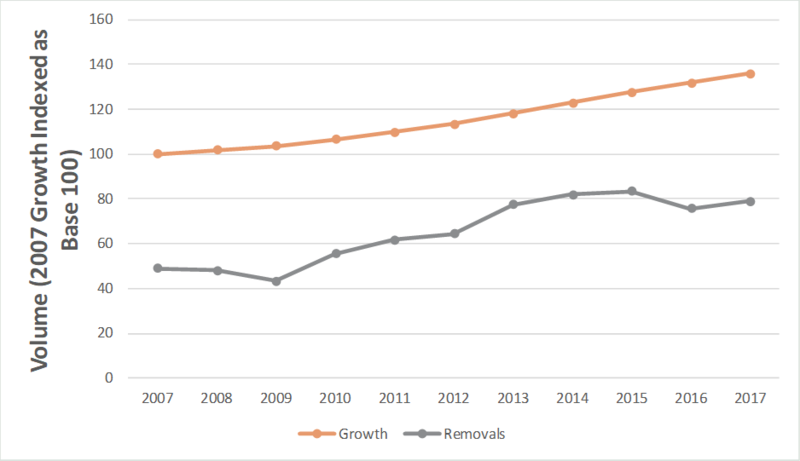 While total pine sawtimber inventory and harvested volume have increased at similar rates, growth still outpaces removals by 82%. As a measure of overall sustainability of the timber resource, this is one of the contributing factors that makes the US South an attractive investment opportunity and has led to numerous upgrades and expansions of existing sawmills. As a result of the abundant pine sawtimber supply, prices have remained low and globally competitive with little volatility—all important criteria for investment decisions. Demand for PNW sawlogs has remained strong but, unlike the US South, timber supply is constrained. 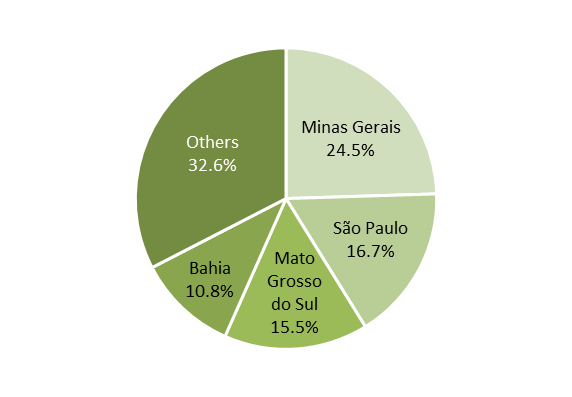 The regional industry is supplied primarily from private lands, which is a finite resource with limits on annual production. Though ample additional timber supply exists on public lands, harvests from these lands is a fraction of sustainable levels. Unlike markets where the timber supply is expanding and prices can adjust downward as supply outpaces demand, the PNW timber supply is tightly matched to lumber and panel production requirements. This limits sawmill expansions and caps residual production to a finite volume. In the aftermath of 2008’s financial collapse, southern sawmills were forced into survival mode. The mills that survived invested in new technology that improved efficiency and lowered costs. It is not, in fact, an overstatement to say that the industry shifted its cost structure significantly. At the same time, as log prices collapsed, landowners simply chose not to sell timber, opting instead to wait out the down cycle. A strange thing happened as a result of this confluence. As landowners waited for a recovery, trees grew larger and mills, owing to their new-found efficiency, used fewer trees. The net result after 10 years was that forests in the US South had more and larger trees, and sawtimber prices in the region are virtually unchanged since 2007. A number of factors contributed to the sudden rise in lumber prices last year, including US tariffs on Canadian softwood lumber that were instituted in 2017, a shortage in log supply in British Columbia (BC) due to mandated reductions to its annual allowable cut (AAC) and back-to-back severe wildfire seasons that interrupted log flow and mill operations. However, despite the ups and downs of the North American lumber market, there has been minimal volatility in southern timber prices since the Great Recession; on the global stage only Brazil offers lower delivered prices. Forest products companies that operate in the South can take advantage of some of the lowest operating costs in the world with almost zero price risk on their largest input cost. In 2017, SYP lumber production totaled 18 BBF, or roughly one-third of total North American production. More than 5 BBF (3+ BBF from new mills, ~2 BBF from expansions) of new SYP lumber production capacity will be installed by the end of 2020, much of which will originate from approximately 20 new mill facilities—both greenfield operations and older mills that will be significantly overhauled. The scale of these new facilities will have an impact on demand for logs produced regionally, as well as the supply of lumber and residuals in the market. While average SYP sawmill production levels in 2012 were roughly 125 MMBF, modern facility improvements will result in an average capacity of roughly 200 MMBF by 2022, and many mills will boast annual capacities of 250 to 350 MMBF. Forest2Market estimates that the capital invested in these new operations will exceed $2 billion. Resource constraints are palpable and restrict production levels for all products in the PNW. Due to limited timber supply, sawlog prices recovered quickly after the lows of 2009; by 2013, sawlog prices had recovered to 2007 levels. Unlike oversupplied timber markets like the US South that can absorb additional log demand without moving log prices higher, log prices in the PNW are very sensitive to additional demand. Additional demand does not stimulate additional harvests; it only stimulates higher prices. Sawlog prices in the PNW are twice as high as those in the US South and on par with traditional high cost markets in Sweden and Germany. All of the data points to a very constrained market that has limited upside before pricing itself out of the global market. The Northwest US market is severely hobbled due to the tight log supply and high costs, which limits sawmill profitability during periods of high demand. Also notable is the fact that very little capital is flowing to the PNW industry, owing in large part to the restricted log supply and high log costs. How do these regional differences impact sawmill profitability? Following the Great Recession and a rise in lumber prices, sawmills began making modest profits starting in 2012. Thereafter, Southern sawmills continued to enjoy low delivered log costs as lumber prices rose, leading to very favorable profit margins. By contrast, log prices rose steadily in the coastal West, leaving sawmills with much smaller margins to work with. In late 2018, lumber prices dropped significantly after peaking to new highs, and Western log prices dropped at a much slower pace. This disconnect led to production curtailments at many Western sawmills, indicating mill margins had dropped below acceptable levels to continue normal operations. While high margins at Southern sawmills are attracting capital, muted margins at Western mills could lead to diminished investment in the near and long terms, further hampering competitiveness in the region.